31 min. Weston Woods. 2018. $59.95. ISBN 9781338232264. 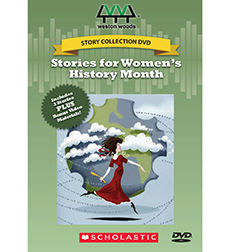 K-Gr 5—What do Alice Roosevelt, Katie Casey, and a pack horse librarian have in common? They are all fascinating women who crashed through the glass ceilings of their time and expanded opportunities for women in a man's world. Barbara Kerley's What To Do About Alice describes Roosevelt as an inveterate tomboy, voracious reader, and ebullient spirit who would not be contained by the narrow expectations and limits of early 20th-century pundits and her father, President Theodore Roosevelt. Each title has a fitting musical background, reflecting the historical period. Best are the fiddle and banjo stylings for Heather Henson's That Book Woman, a heart-wrenching tale of poverty in the Appalachian Mountains during the Depression. The librarian heroines on horseback brought books to families in the remote hills, spreading literacy and education for everyone, and for free. Zooey Deschanel's narration of Shana Corey's Players in Pigtails, accompanied by World War II—era jazz, illuminates the largely unknown All-American Girls Professional Baseball League. Also well-produced are the three bonus interviews of authors Kerley and Henson and illustrator David Smalls (That Book Woman). Each is a gem that reveals the inspiration for the stories and the creative processes of these award-winning books. Unfortunately, the first two books are narrated in a slow and deliberate manner bordering on affectation, though overall, the women's stories triumph. VERDICT This collection of reissued programs is inspired, and the bonus glimpses into their creation seal it as a good buy for elementary-aged students.